Russia’s top politicians—including Putin—are avid artists, whose paintings and photographs have fetched millions at an annual St. Petersburg charity auction. As the chair of Russia’s Upper Parliament and a former governor of St. Petersburg, Valentina Matvienko, is more than just the country’s most well-known female politician. To some, she is considered the best female artist among all of Russia’s politicians. Each painting was a success, with “Snowstorm” going for 11.5 million rubles ($384,000) and “The Marble Bridge” for 13 million rubles ($433 million). Art observers note that perhaps Matvienko excels M-word pictures because her surname starts from the same letter. St. Petersburg is President Vladimir Putin's native city, so it's no wonder that he participated in the same auction in 2009. Putin painted a U-word oil entitled “Uzor na zaindevevshem okne” (Frost-Covered Window Pattern), and it was auctioned off for 37 million ($1.2 million). The picture was purchased by Natalia Kournikova, the owner of Our Artists Moscow art gallery. It’s images were reminisce of Ukrainian folklore, with an image of frost-covered window and curtains with national patterns. When in Kurgan, a city in the Ural Mountains about 2,000 km from Moscow, the president visited school No. 7 and demonstrated his gift of a graphic artist by taking a chalk and drawing several lines on a blackboard. He then explained: "This is a cat. Rear view." 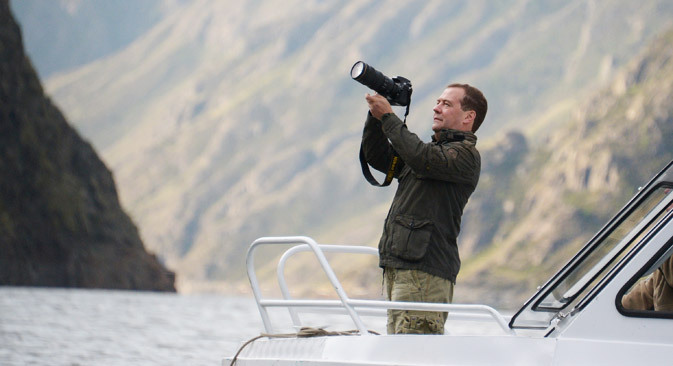 However, Dmitry Medvedev, the former president of Russia and current prime miniter, is not a painter but a keen photographer. He owns an expensive camera and akes pictures at all official and non-official trips. Medvedev even has a blog on the Instagram, where he publishes his work from time to time, one of which—a photo made of a helicopter—was auctioned off at the same Christmas auction for a record-breaking 51 million rubles ($1.7 million).